Distinctive features: Flat-topped white flower head with white flowers. Vein pattern on leaves. Flowers: Summer, Autumn; White; 7 or more parts (petals); 2cm in diameter. Ray flowers: 4-15, white. Disc flowers: 10-40, yellow becoming brown. Usually arranged in a flat-topped cluster, but with exceptions. Leaves: Alternate, Simple; Lance-shaped, with prominent veins. They are smooth when rubbed in one direction, rough the other way. Habitat: Forests, Wet Areas, Moist Meadows; Moist woods and swamps, fens. Notes: This Aster is fairly easy to recognize due to the flat-topped flower umbel (although it does vary a bit). 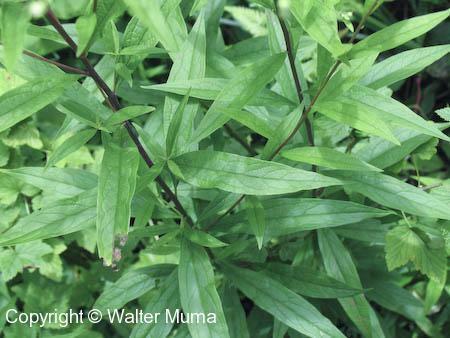 Look for the prominent vein pattern on the leaves, which is distinctive. Photographs: 164 photographs available, of which 13 are featured on this page. SCROLL DOWN FOR PHOTOGRAPHS. Here's how Flat-topped White Aster got its name - the flowers are in a more or less flat-topped umbel. 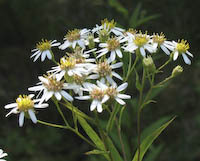 This photo shows the overall shape and form of Flat-topped White Aster. The white flowers of Flat-topped White Aster. Close-up of the flowers. Note the relatively few very pale blue or white rays ("petals"). Flat-topped White Aster seeds in late fall. Flower buds at the end of July. Flat-topped White Aster leaf, showing upper surface.The leaves have very prominent veins. Leaves. Note the pattern of the veins. Underside of a leaf, with dew. 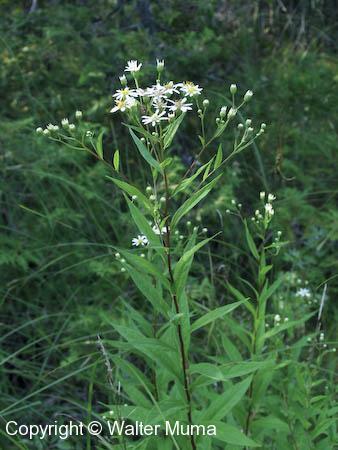 Flat-topped White Aster stems are finely hairy, and sometimes purplish.